Like Samsung and Nokia, Motorola had its fair share of weird phone designs over the years. The company was the world’s first to launch a commercial mobile phone (way back in 1984), and had plenty of time to come up with unusual ideas for its handsets. Of course, today Motorola isn’t what it used to be. Its Mobility division (which separated from Motorola Solutions in 2011) was acquired by Google in 2012, and is now in the process of being bought by Lenovo - which certainly has the needed resources not just to keep the Moto flame burning, but also to allow the company to fight with the major smartphone makers out there. Anyway, talking about Motorola’s future is something we should do another time. Right now, we’ll just present you older Motorola phones that have weird or unusual designs. You can let us know in the comments if you owned any of them, or if you think there are other devices that should’ve made it to our list. Also known as Motorola V.box, the V100 looks more like a toy with its semi-transparent plastic case and that odd QWERTY keyboard layout. The phone is 25mm-thick when closed, featuring a single (internal) monochrome display with 126 x 64 pixels, and a 600 mAh battery. It was launched 14 years ago, in 2000. The V70 was released by Motorola in 2002, captivating users with its iconic design. The handset has a swiveling mechanism and, when it’s closed, its keypad is hidden. The phone features a pretty small white-on-black display with a resolution of only 96 x 64 pixels. Motorola sold the V70 in the US via AT&T (then Cingular) and T-Mobile. Introduced in 2003, the A925 was one of Motorola’s Symbian UIQ-based smartphones. It was big and heavy (210 grams), offering pretty nice features for those days: a centered, resistive touchscreen display with 208 x 320 pixels, stylus, 3G, GPS, and two cameras - including a front-facing one for video calls. The A925 wasn’t sold in the US. As its name suggests, this phone looks like a jewel. Or at least it tries to. It’s a clamshell with a “3D crystal-cut” design which definitely sets it apart from other flip phones (not necessarily in a good way). Its features aren’t too interesting, though, including a 2-inch QVGA internal display, a 128 x 160 pixels external OLED screen, and touch-sensitive music keys. The MOTOJEWEL saw a limited launch towards the end of 2008. Reminiscent of the swiveling Motorola V70 from 2002, Motorola Aura was introduced in late 2008 as a luxury phone made out of stainless steel. It was the world’s first handset to offer a circular display (1.55-inches, 480 pixels in diameter). A 2MP camera and 2GB of internal memory were also included. The Aura was sold for around $2,000, thus being inaccessible to regular phone buyers. Its round display may be at the origins of the upcoming Moto 360 smartwatch. Motorola Ming was a family of smartphones made for the Chinese market, and produced between 2005 and 2011. The first models were based on Linux, while the last ones ran Android. They have a unique design, being clamshells with touchscreens and transparent flip covers. Lots of folks will probably agree that the Motorola Clutch i465 is a pretty ugly phone. Of course, it’s a rugged handset, and these never win beauty contests, so maybe we should forgive the Clutch’s clumsy design. 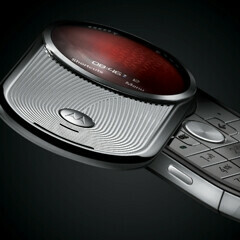 The handset was launched in 2009 as Motorola’s first iDEN phone to feature a full QWERTY keyboard. It also offered a protuberant 1.8-inch display with 120 x 160 pixels (and three shortcut keys on its right side), Bluetooth, and a VGA camera. The FLIPOUT resembles Nokia's Twist - and perhaps Motorola has drawn some inspiration from it, as it launched the FLIPOUT one year after Nokia's phone hit the market: in 2010. Moto's handset features a flipping 2.8-inch QVGA touchscreen display that hides a full QWERTY keyboard, and a 3MP rear camera. It ran Android 2.1 at launch. Motorola MILESTONE XT720 is definitely among the most unusual full-touch smartphones ever, thanks to its asymmetric design. The bottom right of the handset has a bump that houses a camera shutter key, as well as three capacitive buttons that allow you to switch between camera modes: photo, video, or gallery. The XT720 featured Android 2.1 Eclair and a 3.7-inch display with 480 x 854 pixels. It was released in 2010, being the first Android handset to offer Xenon flash (which was paired with an 8MP rear camera). The WILDER is Motorola’s most recent weird phone, being introduced in 2011. It was launched as an affordable splash- and dust-resistant handset, featuring a 2.8-inch QVGA main display, and a secondary monochrome OLED screen below it (this is used for notifications, having a 96 x 16 pixel resolution). Unlike most Motorola touchscreen handsets from the last few years, the WILDER isn’t a smartphone. 1-9 look better than that one plastic phone that everyone hates….. In fact, the Aura looks quite beautiful, even according to todays standards. Something to do with circle or disc like glass and metal. That everyone hates? I don't hate plastic phones, i prefer plastic over aluminum phone. Plastic phone usually cheaper, lighter, better reception and i'm safe from being electrocuted. You hate plastic as well as I do, but I love Galaxy phones as well as the ip5. Wow you're becoming really sad dude. Totally worth it! sauce. In other news, john barrowman/ Malcolm Merlyn will be a series regular for arrow season 3. That Everyone Loves, iFeaturePhone Fan. Sliding, flipping, and twisting is part of James bond....007 classics. Still can't beat this handsets. When I was real young, we all wanted Maxwel Smarts Shoe phone, his Sunbeam Tiger an his partner, agent 99. Wow... I actually owned the V-Box. I have very fond memories of smashing the piece of crap with a cinder block. Yup, slow day at PA. I agree.. even for today standard that phone looks sooo "matrix" imo.. lol..
What about the Motorola Backflip? It was a flip phone with a keyboard on the reverse side, that means it had a camera module on the same side as a keyboard. A friend who had the Flipout in high school earned the title of box-phone guy. And since it was a flashy orange color people would frown when he would take it out. also where i'm from at the time, the Milestone was actually one of the top ten favorite smartphones of all geeks. i always wanted one but was too young to get a phone. Number 8 is quite nice, rotating style phone. Number 9 is awesome, kinda like what the Samsung Galaxy S4 Zoom is, a point and shoot merged with a phone. Nice Motorola, I would've expect so more crazy design but these I can cope with. I had the V100 back in the day. Startacs were kind of unusual with dual battery option back in the day. Though they beat the heel out Moto 555 an the actual bricks they were replacing. I like these posts! Keep them coming, PA! The Ming series had a cousin in the US known as the Krave, which launched on Verizon. I thought the touchscreen/flip combo was very cool back in the day, even if the execution was...uneven. That was the year Motorola came out with its last basic phones that really had effort put into them, like the VU30, which was very similar to the jewel phone above, except the jewel part was limited to its button design while the rest was just a smooth oval. It wasn't long after that that Motorola launched full bore into the Cliq and the Droid instead. The OG RAZR wasn't unusual when it first dropped? It sold like crazy, but I would put it on this list for sure. We had never seen anything like that at the time.